Due to its geographical position, Cordoban cuisine is based on the products of both the Sierra (the hilly region to the north) as well as the Campiña (the river valley). The Sierra region provides game and livestock, whereas the Guadalquivir river valley area provides olive oil, vegetables and Montilla-Moriles wine, all essential ingredients in the local cuisine. Fresh fish is brought from the Mediterranean and the Atlantic and fried fish is one of the most popular dishes among the Cordoban people. In the south-west of the province, between the river valley and the Subbética hill region, olive oil is produced. The best oils, with a controlled Denominacion de Origen (D.O. name of origin), are produced in Baena, whose "virgin" oil, made from the first pressing, is famous for its freshness and its fruity aroma, and in Priego de Córdoba, where the oil is golden-coloured with a sweet, full taste. The Denominacion de Origen itself covers the whole area around the villages and these carefully protected and funded areas are ranked among the best oil-producing lands in the world. In the south of the province, the D.O.P. Aceite de Lucena produces olive oils with a mild, not too sharp flavour and a subtle hint of almonds coming from the Hojiblanca variety of olive. And north of the River Guadalquivir, in Cordoba’s Sierra Morena mountain range, the olive oils from the Montoro-Adamuz D.O. are characteristic for their high content in polyphenols, which give the oil its distinctively bitter, spicy flavour. The most highly-prized oil is always the Virgen Extra (’Extra Virgin’ category), which after maturing in the cellars has, in Type A oils, an acidity of less than 0,4 º (based on the percentage of oleic acid content) and less than 1º in Type B oils. Olive oil is a basic ingredient in most traditional Cordoban dishes. The valleys in the south of the province of Córdoba are the home of the well-known wines from the Montilla-Moriles D.O. (name of origin). There are several types, such as Fino, Amontillado, Oloroso, Cream, Pedro Ximénez, Blanco Joven (Young White) and organic wines. The dominant grape is the white Pedro Ximénez variety, which accounts for over 80% of the area planted with vines. These wines are matured in American oak casks or barrels, in areas called criaderas or soleras and using the technique known as velo de flor, consisting of a thick layer of yeast left floating on the surface, which gives the wines of Montilla-Moriles their distinctive flavour. There is a wide range of liqueurs, including the dry or sweet aniseed liqueurs from Rute, a village in the Subbetica hill region of Cordoba province which has a long tradition of distilling this type of liqueur dating back to the 17th century. 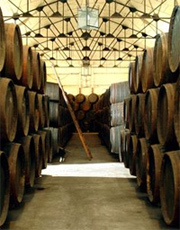 The reputation of Montilla-Moriles vinegar dates back to the origins of winemaking in the area, where since ancient times, wine has been transformed into vinegar through the process of acidification. The Montilla-Moriles P.D.O. vinegar is aged by an oxidation process in oak barrels. The blending is carried out either by a traditional static system called “añadas” or the traditional dynamic system of “criaderas y solera” which is similar to that used to make the Montilla-Moriles P.D.O. wine. The north of the province, especially the area known as Los Pedroches, brings a range of meat products to the local cuisine, including cattle producing first-rate beef and veal, top-quality lamb and most importantly, pigs bred in the open fields on a diet of acorns, which produce excellent ham. Apart from other pork products such as the chorizo and morcilla sausages, meat is used in many well-known traditional dishes from Rabo de Toro (Bull’s Tail), to Flamenquín (Ham and Pork rolled fritter) or Cochifrito (deep fried cubes of pork). The large number of game hunting reserves in Cordoba provides the local taverns, bars and restaurants with a range of relatively uncommon meats such as venison, wild boar, mouflon, roe deer, rabbit and partridge, to name but a few.